It is rare that floorplans comes available to rent, as Sycamore Terrace has rented off a waitlist since the beginning of 2017. 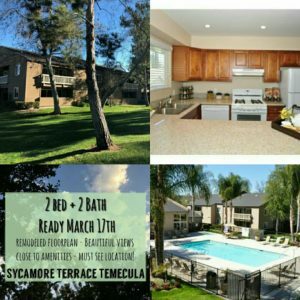 Are you interested in renting at Sycamore Terrace Apartments in Temecula? Send us an inquiry on the Contact Us page for more information on how to get started with the rental application. The office at Sycamore Terrace is open every day from 9am to 5pm. We would love to make Sycamore your new home!